There’s something special about a name. 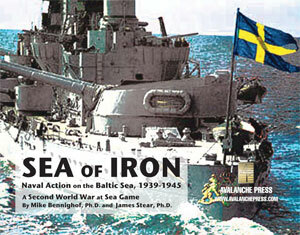 I had known for a long time that we would publish at Second World War at Sea game set in the Baltic Sea, but it became somehow real when I hit on the title Sea of Iron for it. I liked that the title had both metaphorical and mundane meanings to it, and from that moment on I knew exactly what sort of game Sea of Iron should be. Sea of Iron is an unusual game in the series. It has a very small operational map (just 18x12 inches, about one-eighth the surface area of those in Bismarck or Strike South) yet relatively large forces in action on it (with more pieces in the box than either of those other games just mentioned). While most of the aircraft in the mix have very short ranges, they don’t need really long legs to cover this tiny sea. If the Mediterranean of La Regia Marina is a bathtub, then the Baltic Sea is a teacup. You send your fleets to sea and you’re very likely to see some sort of action. In the actual events, surface battles – what I consider the heart of Second World War at Sea game play – were pretty rare. The tiny area in play made mine warfare extremely important, since participants could, and did, seal off entire branches of the Baltic with minefields backed by large-caliber coastal artillery. But there were battles all the same, and operations that could have led to battles, and planned operations that could have led to still more battles, so I had plenty of action with which to work. The heart of any historical game is its scenario set. It’s true. Sea of Iron pre-dates my fascination with the story-arc concept, though if you look closely at the scenario set you can see how it’s evolving in that direction. There are 36 scenarios; twenty battle scenarios and sixteen operational scenarios. They cover three actual wars (Germany vs. Poland, Finland vs. the Soviet Union, and Germany vs. the Soviet Union). In some ways that’s actually four wars, as naval activity in the German-Soviet conflict tends to concentrate in the weeks before the war began and those during the Soviet advance along the German Baltic coast in the late winter and spring of 1945. Most of the historical scenarios are pretty small; the Poles and the Finns had tiny surface fleets without a lot of naval air support and the Germans proved decidedly averse to risking their heavy ships in the Baltic Sea (or anywhere else for that matter) until the final days. So we have scenarios for all of the actual battles and operations, but more interesting are those extrapolated from the actual war plans of various nations, both those planned by naval staffs and those they suspected their enemies might attempt. For example, at one point the Germans believed the Soviets about to conduct a breakout from their naval base at Kronstadt near Leningrad and make a run for neutral Sweden to seek internment rather than allow their heavy ships to be battered to pieces by German siege guns and dive bombers. The Germans formed a “Baltic Fleet” built around the battleship Tirpitz and stationed it in the Ӓland Islands to intercept the Soviets should they make it past the artillery, aircraft and minefields awaiting them. The plan came to nothing – the Soviet warships stayed in their harbors and were for the most part pounded into scrap iron – but it makes for good operational and battle scenarios, letting you use Tirpitz against a pair of ancient Soviet battleships (hint: always bet on the big dog). I had good information on Soviet and Swedish naval planning for war in the Baltic. Both were fairly conservative, with the Soviets showing an odd duality of purpose: on the one hand reluctant to risk their heavy ships beyond the protective heavy guns and minefields of Kronstadt, on the other drafting ambitious plans for amphibious landings in the Ӓland Islands and the Swedish island of Gotland, and even on the Swedish mainland to assault the capital of Stockholm. The Swedes for their part displayed their own duality, looking to take advantage of the dense islands east of Stockholm to conduct surprise torpedo attacks while building relatively large coastal-defense battleships and very fast destroyers not intended for coastal use at all but to locate and engage the Soviets in the middle of the Baltic (which would still count as coastal waters for most navies). The unusual Swedish “aircraft cruiser” Gotland, rapidly made obsolete by advancing aircraft capabilities, had been designed to support this mission by locating and tracking an advancing Soviet fleet with her seaplanes, allowing the surface battle group to engage them. Germany, meanwhile, crafted her own plans for invading Sweden, and they yield a set of surprisingly balanced scenarios thanks to German misconceptions. It’s pretty clear from the Swedish side that the Swedish Navy would sortie to fight the Germans, yet German plans centered on preventing the Swedish crews from scuttling their ships in deep water outside the main naval base at Karlskrona. Not expecting the Swedes to come out and fight, the planners gave the invasion convoys much weaker escorts than they probably needed. The old Swedish coastal battleships are simple targets when confronted by Tirpitz, but they can certainly take care of the ancient pre-dreadnought Schleswig-Holstein. Not content to sit back and wait to be invaded, the Swedes crafted invasion plans of their own, an effort to storm across The Sound at the very end of the war and liberate Denmark. Two infantry divisions and an armored brigade would land near Copenhagen to prevent the die-hard Nazis believed to be fleeing to the Danish capital from conducting massacres of the civilian population. The few remaining German major surface warships had gone to the Danish capital as well, and the Swedes prepared to fight them if necessary to protect their beachheads. The game includes a wide array of pieces, with the full Swedish, Soviet, Polish and Finnish fleets (all of their actual warships and a good many planned but never built or completed) and much of the German Navy as well. Thanks to all of those war plans, we get to use just about all of them in scenarios (I’m pretty sure we actually did put all of them to use, but I’ll hedge a little just to be sure). It was a satisfying project to design, and I think we’ve provided plenty of play value in the box. The tiny map makes Sea of Iron an unusual Second World War at Sea game, and that’s part of the fun.